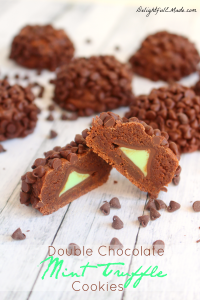 Need a super-easy, no-bake cookie idea? 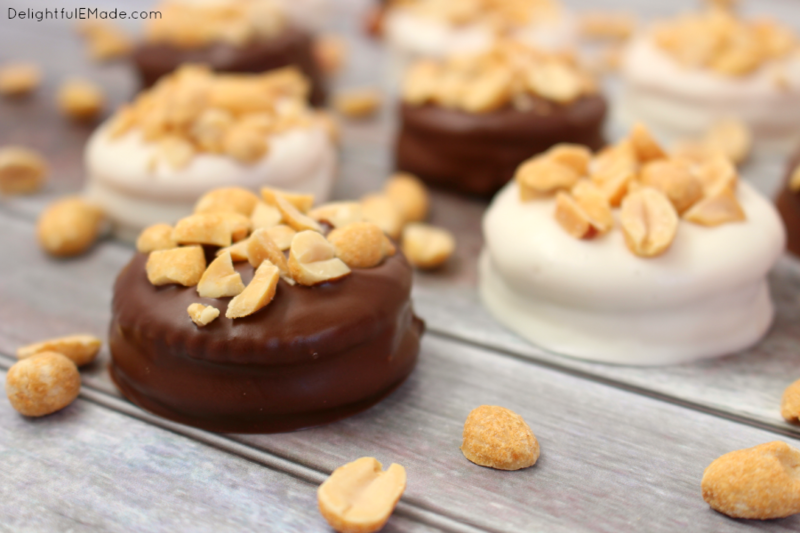 These amazing Chocolate Dipped Ritz Cracker Cookies are definitely the way to go! Stuffed with peanut butter, these no-bake cookies are super easy to make, and perfect for any Christmas cookie tray, or whenever you want a savory, sweet treat! 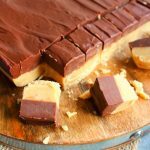 When it comes to snacking, there is something about the combination of peanut butter and chocolate that is so satisfying and delicious! 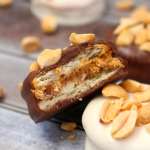 The savory flavors of peanut butter combined with sweet, smooth chocolate and the crisp crunch of Ritz crackers is the ultimate treat. 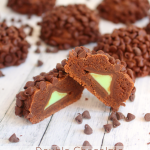 These Chocolate Dipped Ritz Cracker Cookies are not only fantastic for satisfying your sweet tooth, but a great addition to your Christmas cookie list. Because these cookies are no-bake, they’re the perfect for the busy holiday season. They’re fantastic for gifting, too! Making these simple sandwich cookies is as simple as 1-2-3. I’ll break down the steps and show you exactly how to make these yummy Ritz Cracker Cookies. Begin spreading peanut butter between two crackers. 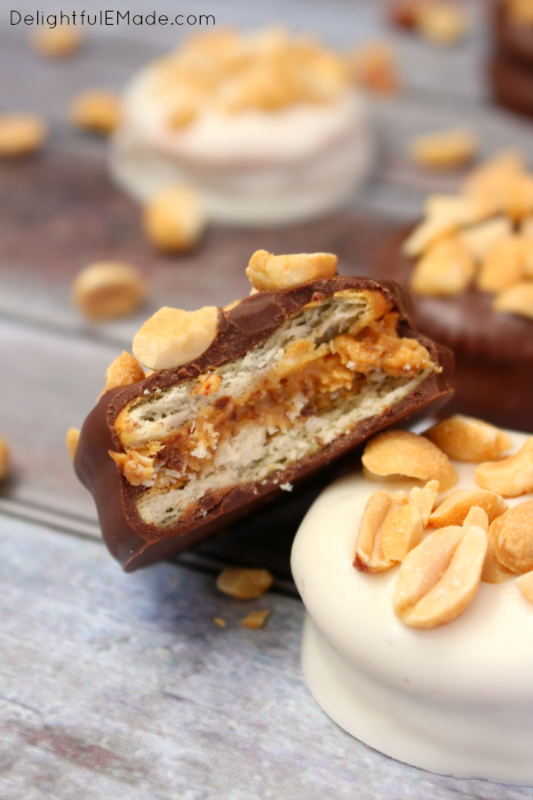 You can use creamy or crunchy peanut butter – which ever you prefer. 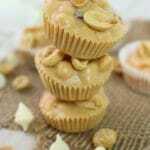 Use about a 1/2 tablespoon of peanut butter per cookie. Step 2: Top with another cracker to make a sandwich. Step 3: Dip the sandwich into the melted dipping (white and/or dark) chocolate. For this I like to use CandiQuik, which can be found in most grocery store baker aisles. 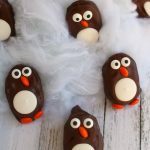 You can also use candy melts or melted chocolate chips, too! Step 4: Top with chopped peanuts. 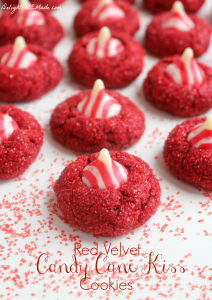 You can also top these with pretty Christmas sprinkles for extra holiday cheer! No baking, no mixing – the ultimate easy, no-bake cookie recipe that is just as delicious as it is pretty! These simple Ritz Cracker Cookies are not only a great snack, they’re fantastic on your holiday cookie trays. Make a big batch of these cookies, and box up for friends and neighbors for a sweet gift. They’re also great to take to teachers or co-workers for a nice way to show your appreciation! 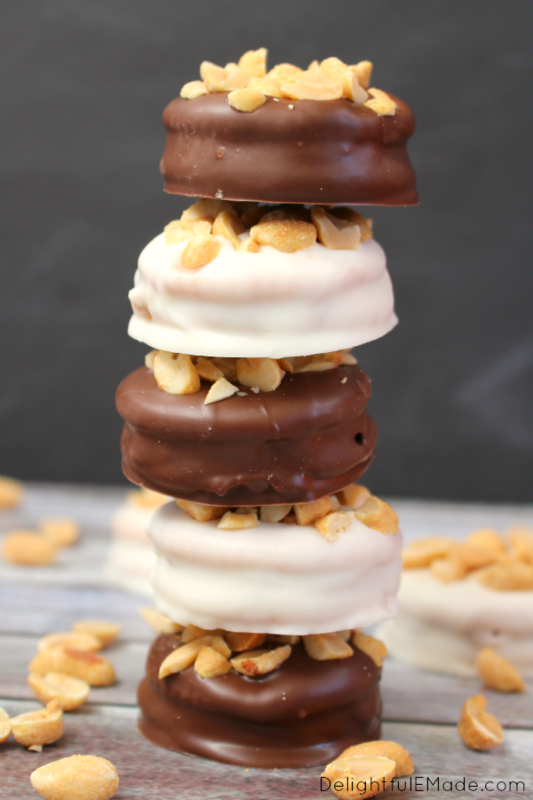 I love making these Chocolate Dipped Ritz Cracker Cookies with both white and dark dipping chocolate. Both chocolates go wonderfully with the creamy, crunchy peanut butter, and the alternating colors look fantastic. They’re just as attractive as they are delicious! 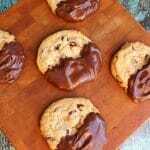 The peanut butter is definitely the star of this cookie! Once you bite into these sweet snacks, you’ll see just how amazing the flavors and textures are – absolutely delicious! I’ve also made this type of cookie using OREO cookies. Check out my post over at Lil Luna where I’ve made Valentine’s Day OREO Pops. 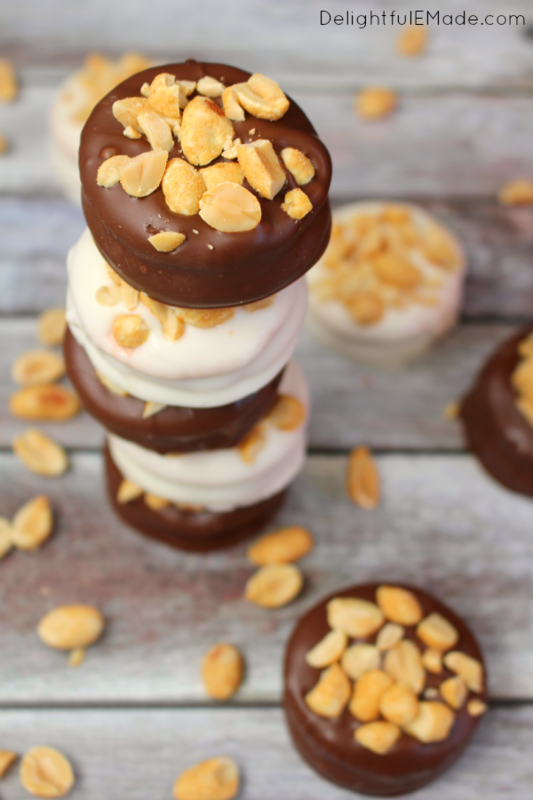 Peanut butter and chocolate come together for an easy, delicious treat! These no-bake cookies are super easy to make, using just a few simple ingredients and are perfect for any Christmas cookie tray, or whenever you want a savory, sweet treat! Gather your ingredients, and place a large sheet of waxed paper on your flat work surface. Chop the peanuts, and melt the dipping chocolate(s) according to package directions. 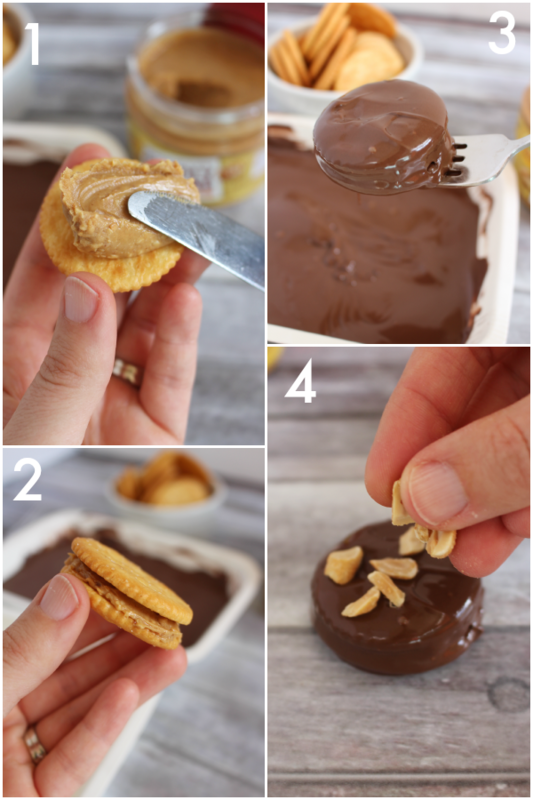 On a cracker, spread a tablespoon of the peanut butter onto the cracker. Top with a second cracker to make a sandwich. Dip the sandwich into the melted dipping chocolate, making sure to coat the entire surface, including sides and top. Transfer cookie to the waxed paper. While the chocolate is still wet, sprinkle the tops of the cookies with chopped peanuts, about 1-2 tsp. Let the chocolate cool and set, usually takes about 15-30 minutes. Enjoy right away, or store in an airtight container. These also freeze well to be enjoyed later. Instead of peanuts, feel free to sprinkle seasonal sprinkles on top of the cookies. You can easily find seasonal sprinkles for Christmas, Valetine's Day, Easter, July 4th and Halloween. Oh that's a really great idea to make such lovely sandwiched cookies! These are great. I'm bring cookies to share after our Christmas program with others in the church and was looking for something new. These just fit the bill - I will be making them !!! Thanks so much for sharing so I can share. Blessings. 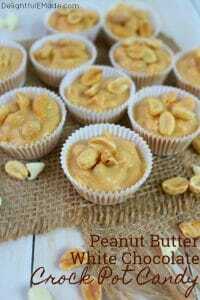 Wow these looke good cant wait to make them! This sounds super easy and yummy too! 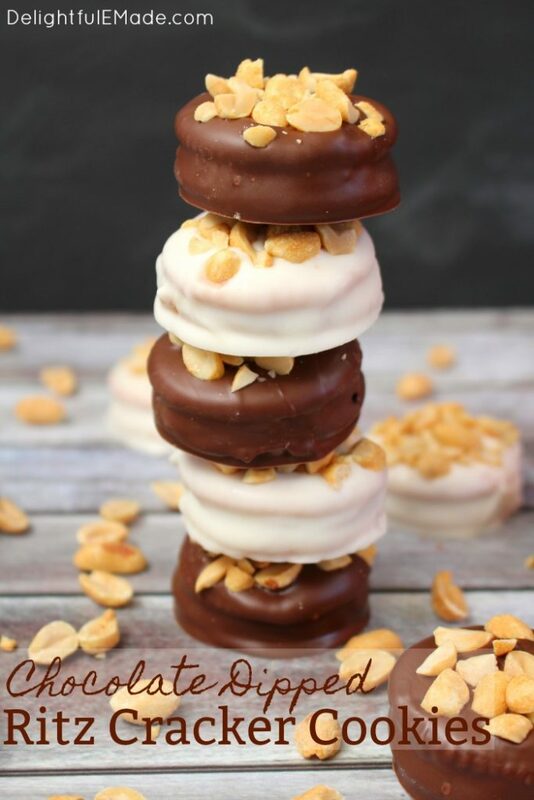 Such a simple and great idea to make sandwich cookies. Thank you for linking up with us @ #HomeMattersParty.We would love to have you again next week. HI! 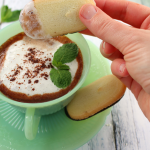 Thanks for linking up to the Tasty Tuesday linky party last week. 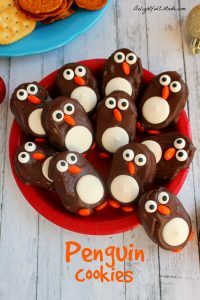 I have pinned your recipe to the Creative K Kids Tasty Tuesday Pinterest board. I hope that you'll join us again this week! How fun and darling! I have to have a chocolate one, please! Thanks so much for linking up to Throwback Thursday! I'll be pinning to our board! Be sure to follow us there! I was shopping at Aldi's the other day and ran across a specialty limited edition Jiff peanut butter that was just AWESOME. 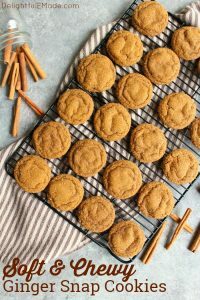 It is Jiff Whipped Pumpkin Pie Spice Peanut Butter and the flavor is the best I have ever tasted..going to make some of these little cookies with it and will let you know how it turns out. easy enough and great snack plan to try them this week thanks.